The Junior Aerospace Engineer Camp will bring the science of IMPACT to the underserved and underrepresented community of students ranging in age from elementary school to high school. IMPACT is partnered with Casa de la Esperanza who will recruit and provide students to the program. The camp will follow a group of students from elementary school to high school hosting camps every other summer for five years. The first installment of the camp (summer of 2014) will explore rockets and consist of two one-week sessions for 5th and 6th graders. The second installment (summer of 2016) will explore model rockets and aerodynamics of flight and consist of two two-week sessions for 7th and 8th graders. The final installment (summer 2018) will ask participants to design, build, and operate a LEGO Robotic Lunar Rover and will consist of two three-week sessions for 9th and 10th graders. The program is based off the successful pilot run of the program where 10 students from Denver worked in teams to develop and operate a robotic rover. IMPACT has and will remain a supporter and participant in International Observe the Moon Night (InOMN). InOMN is an annual event aimed at increasing the general publics knowledge and awareness of lunar science. 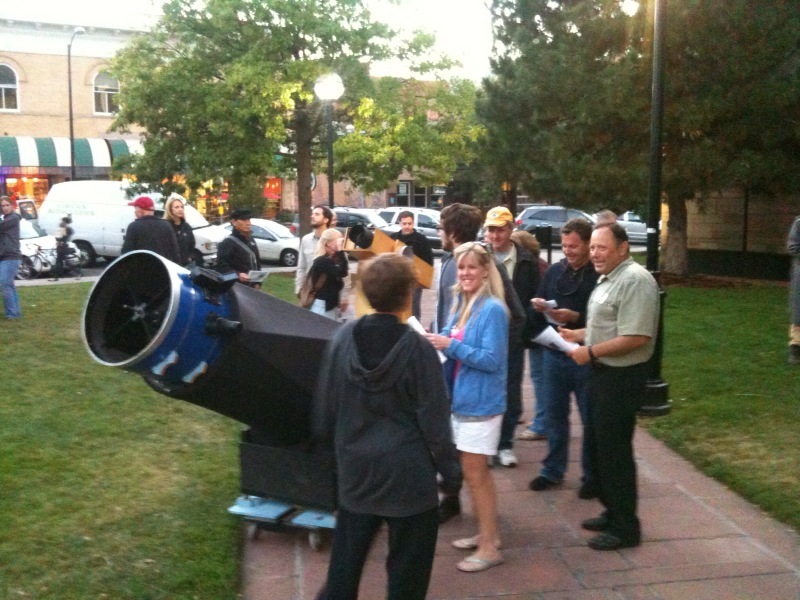 Every year since 2010 IMPACT/CCLDAS has participated by providing knowledgeable staff and two reflecting telescopes (with 15" and 17" primary mirrors) placed on Boulder's Pearl Street Mall. Typically there are a few hundred people that attend and take a chance to look at our moon, maybe for the first time, through a telescope and learn something they didn't know from IMPACT staff. On the far right is IMPACT's PI Mihály Horányi bringing to life the wonders of the moon to curious passers-by. In addition to InOMN, IMPACT has hosted and will continue to host various public events. IMPACT has participated in public viewing parties including the 2012 Venus transit and solar eclipse. The eclipse viewing party set a world record for the largest number of people to view a transit. In attendance were nearly 10,000 people and was hosted at CU's Folsom Field. 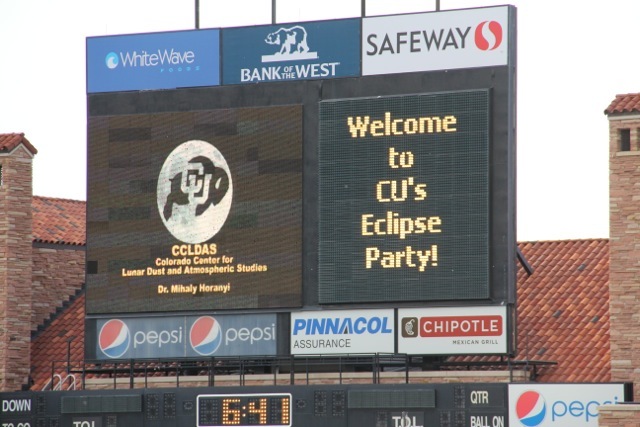 CCLDAS (IMPACTs predecessor) is acknowledged on the jumbotron screen at Folsom Field for the 5/20/2012 eclipse viewing. The Friday Afternoon Physics Club (FAPC) is designed to engage high-achieving, college bound high schoolers in hands-on experiments in IMPACT's lab. The experiments will employ the use of the Mini Plasma Discharge Machine (MPDM) that was assembled by four high school students in the summer of 2012. The MPDM consists of an evacuated Pyrex tube backfilled with argon, a heated filament and DC power supply to maintain discharge plasma, and a Langmuir probe for plasma measurements. Our New Media Practitioner Professional Development Workshop seeks to ensure that New Media practitioners are sharing correct and accurate interpretations of NASA and IMPACT science with the general public. The Institute for Modeling Plasma, Atmospheres, and Cosmic Dust (IMPACT) is committed to educating and training the next generation of scientists and engineers. IMPACT is committed to enhancing the education of science and engineering graduate students at the University of Colorado at Boulder. IMPACT supports graduate students academically and professionally via involvement in graduate courses, seminars and support for travel to science conferences throughout the year. Every semester, the University of Colorado offers a planetary seminar discussing various topics related to the field. Astronomy, aerospace engineering, and geology students interested in planetary science usually attend these seminars. In the past, IMPACT faculty have been involved with these seminars by volunteering to be instructors. One such seminar was lead by IMPACT's Mihály Horányi and Zoltan Sternovksy discussing space instrumentation as applied to lunar exploration. IMPACT plans on maintaining its presence in the planetary seminars as it provides students an in-depth look at planetary science and provides an excellent environment to hone presentation skills. Aside from the planetary seminars that are offered every semester, the University of Colorado offers a much more rigorous seminar offered every two years. As topics rotate every two years, IMPACT is dedicated to providing faculty to lead one such seminar. Possible topics include "Asteroids" or "Airless Bodies". The Physics Department offers a graduate course on plasma physics listed as PHYS-5150. This class now includes a dusty plasma section discussing physical processes on the lunar surface as well as simulation and computational techniques. The aerospace engineering department has developed an undergraduate senior design project aimed at mimicking the instrument development process. The course is structured as a NASA hardware project and asks students to development instrumentation for a variety of applications. IMPACT has been heavily involved in this class and will continue to do so acting like an industry customer to undergraduate design teams. IMPACT's predecessor CCLDAS, initiated and maintained the successful Lunar and Small Bodies Graduate Conference held during NASA's Lunar Science Forum. LunGradCon provides graduate students and post-docs an environment to present their work and network with peers. At the discretion of SSERVI, IMPACT will remain a supporter and leader for LunGradCon.